Ask anyone to tell you about the ideal setting for their dream vacation and they will probably describe a picture perfect vision of rolling hills clad in dense green bush, topped with towering ferns and crisscrossed by crystal clear creeks, all exuberantly tumbling down towards the shores of the deep blue sea where a curvy sweep of pale white sand neatly divides solid ground and whispering waves. 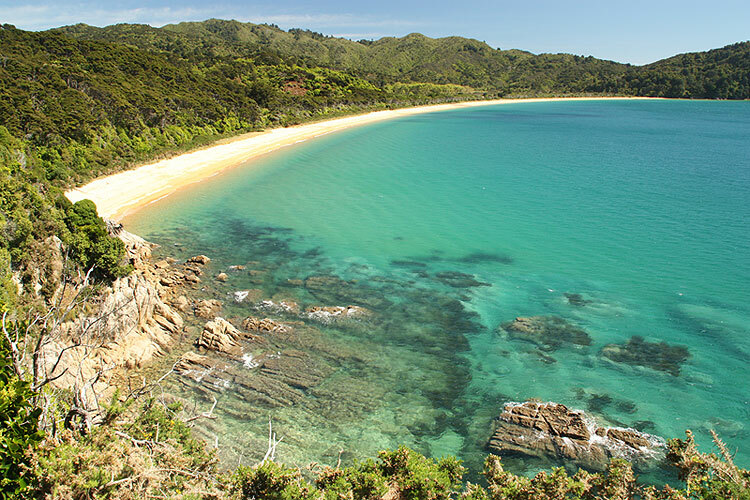 In short they will just have described the Abel Tasman Coast Track, one of New Zealand’s 9 Great Walks. Now, you would be hard pressed to find a country more hiker friendly than New Zealand: thousands of kilometers of tracks and routes wind around the countryside, and a nationwide network of backcountry huts provides safe shelter and welcome comfort at the end of a long day’s tramp (for in New Zealand you do not hike, trek or bushwalk: you tramp). The Great Walks showcase the best of this system and make some of the country’s most iconic and beautiful landscapes accessible to trampers of all levels of experience and fitness thanks to benched tracks, modern huts and obliging hut wardens. 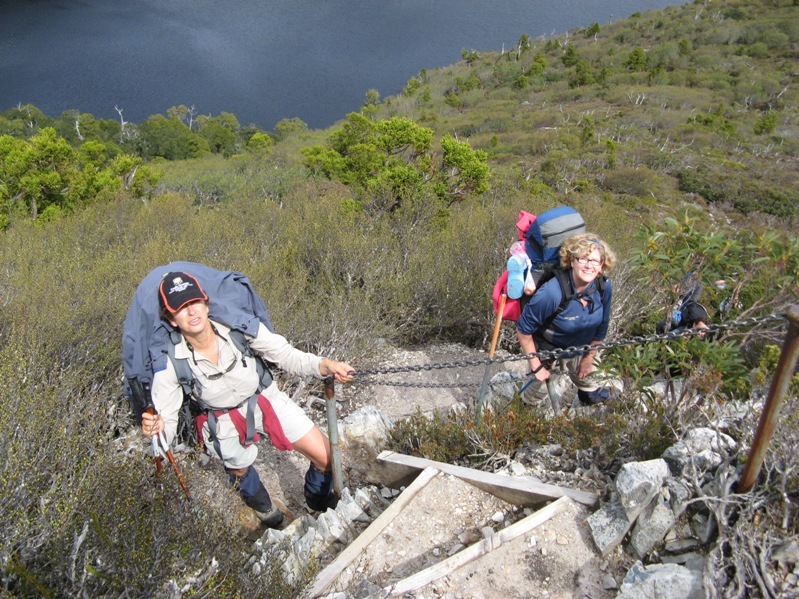 By New Zealand standards, the walk is flat as – you will never gain more than 200m elevation. The days are short –an average of 12 km / 4 hours walking a day. The Tasman area benefits from the best weather in the South Island – from late spring through to the end of summer you can count on warm sunny days with only the occasional shower. Access is easy and the itinerary is flexible – thanks to bus shuttles and water taxis, you can get dropped off / picked up all along the track, which means you are free to decide whether to tramp its full length or only part of it. First off, you must be aware that the Coast Track is peculiar in that it features 3 tidal crossings. This means you will have to time your trip with the tides in order to cross streams and estuaries at their lowest water level. Although an alternative high-tide track is provided at the 1st crossing (Torrent Bay), there are no alternatives at Onetahuti and Awaroa. It is essential to obtain a current tide timetable and carefully plan your trip according to it. Because the track is mostly wide, smooth and flat, tramping boots are not an absolute necessity and you can get away with walking in sneakers. 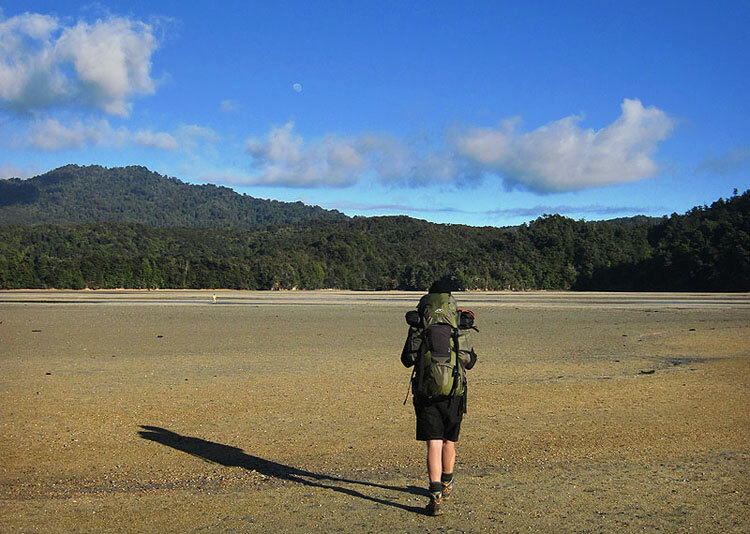 Remember to bring a pair of sandals for the tidal crossings – you won’t want to wet your tramping shoes, but you will want to protect your feet from prickly shells, particularly in Awaroa Inlet. Even if you are sleeping in the huts, you will still need a good backpack with a hip belt to carry some heavier essentials such as a sleeping bag, a stove and enough fuel and food for the duration of the trip. There are neither supplies nor cooking facilities to be found along the track. Potable water can be found on tap at every single hut. Although all campsites also feature a tap, the water there is not potable and must be filtered or boiled for 3 minutes. This is especially important as giardia (diarrhea inducing parasite) is known to occur in the park. New Zealand being New Zealand, do pack a waterproof jacket and a warm jumper anyway, and never leave without insect repellent to fight off the sandflies! Because the Coast Track is extremely popular in summer, make sure to book your huts and/or campsites early. You’ll need 4 or 5 days to complete the Coast Track. 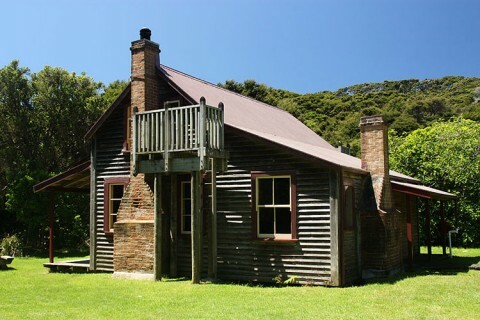 A classic itinerary is to start in Marahau, at the southern end of the park, spend each night at a hut (there are 4: Anchorage, Bark Bay, Awaroa and Whariwharangi) and finish either in Totaranui or Wainui. The latter is the true end of the track, and is thus located at the northernmost extremity of the park. Should you finish there, you will have no choice but to take a bus shuttle back as water taxis do not go that far north. This is the main reason why many trampers choose to finish a day early in Totaranui: going back to Marahau by water taxi is faster and a lot more fun! Should you fancy doing things differently, getting away from the crowds and saving a bit of money in the process, there are about 20 campsites to pick from along the track. Whether you choose to camp outside or stay in huts, go north or south, walk the whole track or only parts of it, always allow yourself plenty of time. Although walking from hut to hut may take as little as 3 to 4 hours, there are many tempting detours along the way: descending to every single signposted bay or exploring the creeks on the inside of the park will take extra time and energy. These detours are also very helpful if walking in a group of varying abilities: while novice trampers may walk straight on to the next hut, more experienced members of the party can check out all the side tracks, leaving everyone to meet up again happy and satisfied at the end of the day. And here comes the best part: all huts and campsites are right by the beach. The sea beckons. 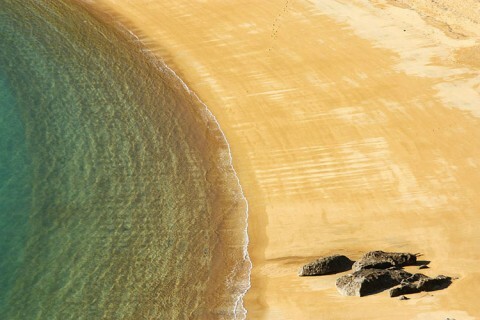 Have you walked the Abel Tasman Coast Track? Do you have any New Zealand tramps you would love more information about? Shoot us a comment and we will see if Stef can do an article, she is there now, living the dream. 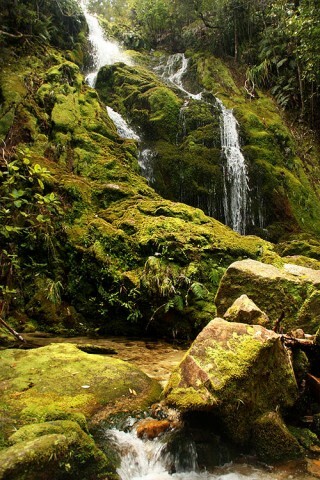 I was in the Abel Tasman park on a visit to New Zealand 4 years ago, and thought it to be stunning! Although I sadly didn’t do any tramping (was a family trip to visit my sister and my parents can’t do much walking any more), we did spend a day kayaking along the coast (seal pups are adorable!) and I just couldn’t get enough of it! I went back to NZ this past January and this time made the most of my visit by doing as much hiking as possible, but sadly none of the multi-day treks. 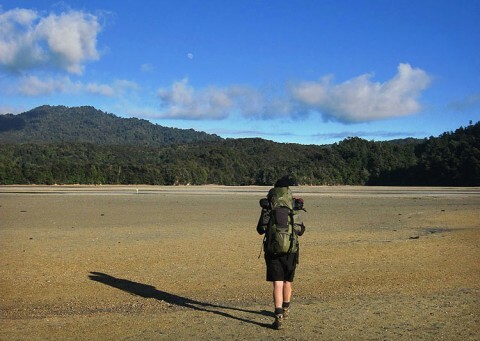 I did do the last leg of the Kepler track… double distance! (to the hut and back from the “end” point) It is a fabulous country for hiking! And I’ve never felt as safe there out on my own as in any other place I’ve visited. No. But now I want to! We’re going to do this hike (sorry, tramp!) very soon, and are super excited!!! We usually prepare our own dehydrated food for hikes in Australia, does anyone know if home dehydrated foods such as pasta sauces and fruit leathers will be allowed through customs? Tough question, we tried to look it up for someone else and did not really get a clear answer. The website was very confusing. Mmm, will put it on our Facebook page and see if anyone knows and then let you know. Thanks! FWIW I also looked online, it kind of seems like commercially packaged food would be fine, which ours obviously isn’t, so really just hoping for anybody’s personal experience. We went tramping in NZ in December 2011. Customs was very strict and looked at every bit of food. I took original packets of everything unopened. They only confiscated my milk powder because it had been opened already (but still in original box). They said to write the ingredients of everything if you dehydrate meals but I still recon it could be confiscated. They even opened my brand new tent (never used and tags still on) and vacuumed the inside! Not sure the effort of dehydrating would be worth it. We walked the Milford track. It was stunning. Amazing weather and the huts were incredible. Thick mattresses and single bunks and gas stoves! BUT when we tried to walk the Able Tasman it rained for 5 days straight and they declared a state of emergency and closed the roads. We turned around after the first night. However, NZ is such a beautiful place and well worth it. This will be really useful information for other visitors to NZ. You first trip sounds great, shame about the rain on the Able Tasmanan. WOW – I never ever realised that New Zealand was so beautiful. I love the idea of walking along the coast track…it looks perfect! Stef is a lucky girl, she is out somewhere again as I write this. You’ve made me want to go to New Zealand! Such beautiful photos! With regards to your food question, I have taken commercially-prepared frozen meals into NZ before but at one stage during my ‘questioning’ I thought they were going to bin the lot. I assume that any undesirable stowaways (eg. bugs) would not survive dehydration so dehydrated meals should be fine. Vacuum packed storage would probably be a better bet than zip locks. To be safe, I suggest you contact the NZ consulate and verify what you would need to do. Let us know what the outcome is because I want to go to NZ in 2013 and would prefer to dehydrate my own meals, just like you. I assume you have read the relevant websites? “Plant products fall into three major categories: human consumption, animal consumption and products not intended for consumption. Items manufactured from plant materials may be carrying either viable seed or insects. Generally an inspection is required to determine the risk status. Dried edible plant products require inspection on arrival to determine risk status. In the case of some seeds (especially popping corn) specific conditions for importation apply. All nuts for eating, particularly those in shells, require inspection. In the case of whole macadamia and walnuts, treatment may be necessary. “Stored Plant Products intended for Human Consumption can be imported from all countries in accordance with the import health standard BNZ-NPP-HUMAN Importation into New Zealand of Stored Plant Products Intended for Human Consumption (176 KB). 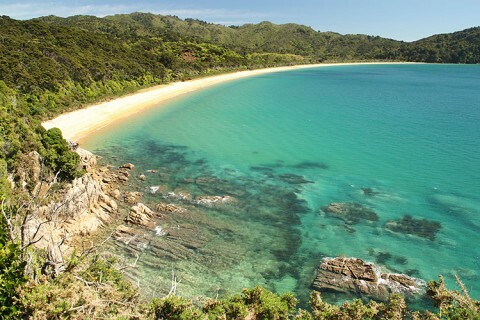 The Abel Tasman area is beautiful. I’ve not actually hiked there but did a multi-day kayak there a few years ago. The beaches that we pulled in at were idyllic. I’m sure the hike would be just as good. Like the sound of having to timing your walk with the tide too – be an interesting additional factor that you don’t usually have to think about! Stef is over there somewhere wandering around. She is living the life! On a walk close to our home, the Great Ocean Walk, watching the tides is important. There are a few images on this article: Guided trips on the Great Ocean walk You have to be especially careful at Wreck Beach! Hiking in New Zealand looks wonderful, I have never been there..the Abel Tasman Coast Track will be on my list of things to do. 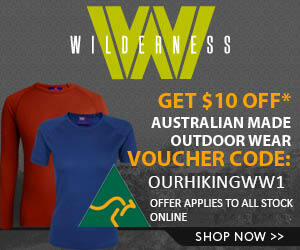 You must visit the Gold Coast and do some hiking in the Gold Coast Hinterland. Maybe you have? Did a short walk over the weekend only 4km to the Purlingbrook Fall Springbrook a great spot.